Most of the nearly two-billion children in the developing world are inadequately educated, or receive no education at all. One in three does not complete the fifth grade. If we allow this situation to perpetuate, the world will be plagued by generations of undereducated youth relying on the support and generosity of others to live with the bare minimal of sustenance. The individual and societal consequences of this chronic global crisis are profound. Children are consigned to poverty and isolation--just like their parents--never knowing what the light of learning could mean in their lives. At the same time, their governments struggle to compete in a rapidly evolving, global information economy, hobbled by a vast and increasingly urban underclass that cannot support itself, much less contribute to the commonwealth, because it lacks the tools to do so. Any nation's most precious natural resource is its children. However, children are often limited in their development by their circumstance and almost never by their capabilities. We believe the emerging world must leverage this resource by tapping into the children's innate capacities to learn, share, and create on their own. We want to provide each child in need with an opportunity to change their future by giving them the chance to access education and information. OLPC's answer to this challenge is the XO laptop. The XO laptop is specifically designed to enable and encourage children to learn independently and share collaboratively. It helps children with the most limited of resources engage in learning on their own with little guidance required. Extensively field-tested and validated among some of the poorest and most remote populations on earth, the XO uniquely fosters learning to learn by allowing children to think about thinking, in ways that are otherwise impossible. Using the XO as both their window on the world, as well as a highly programmable tool for exploring it, children in emerging nations will be opened to both illimitable knowledge and to their own creative and problem-solving potential. 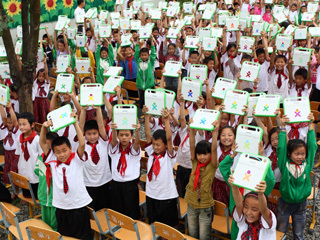 OLPC is not, at heart, a technology program, nor is the XO a product in any conventional sense of the word. OLPC is a non-profit organization providing a means to an end--an end that sees children in even the most remote regions of the globe being given the opportunity to tap into their own potential, to be exposed to a whole world of ideas, and to contribute to a more productive and saner world community.